Sensor: The sensor size and resolution is same, however if we believe in press release and Canon USA website the sensor used inside Canon 7D Mark II is the new one with new one, not same as of Canon 70D DSLR. 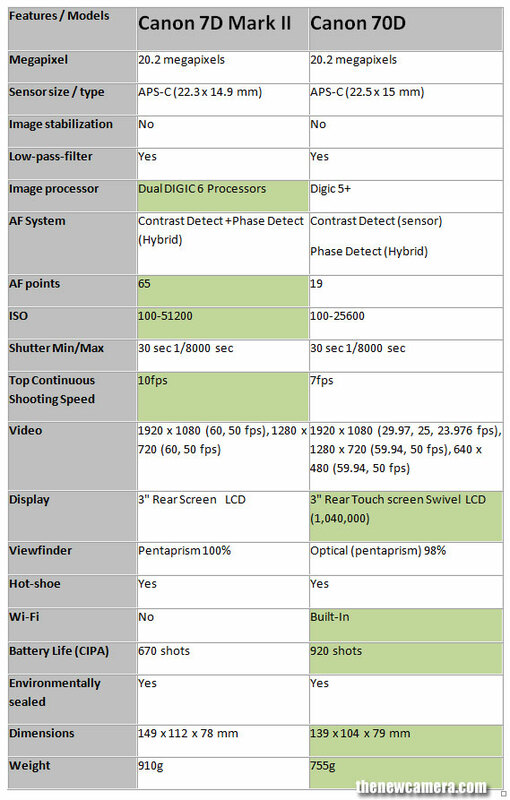 ISO range: The Canon 7D Mark II offers ISO range of 51200, Canon 70D is limited to 25600. Due to more ISO range we will sure get better low light performance from Canon 7D Mk 2 DSLR. AF system: The camera uses newly developed AF module that features 65 all cross-type AF points Canon 70D is limited to 19 AF points only. Touch screen in 70D – The Canon 70D gives you a var-angle monitor and touch screen, Canon gives you fixed LCD screen without touch… so Canon 70D monitor is better than Canon 7D. The Canon 70D offers built in WiFi connectivity and bit better battery life. Verdict: Based on specification comparison review Canon 7D mark II is a clear winner when compared to Canon 70D, the 7D Mk 2 comes with better sensor, advance AF system and more ISO range.